We provide Annual HVAC Maintenance for your Air Conditioner, Heat Pump, Gas Furnace, Oil Heater & Geothermal equipment in the Dillsburg, Mechanicsburg & Camp Hill PA area. We highly recommend regularly scheduled HVAC maintenance, once a year for cooling and once a year for heating. In this way, many problems can be avoided before they arise, and your system can be kept in peak operating condition. Your heating and/or air conditioning system is not a household appliance like a refrigerator. It is a field designed/assembled system that requires professional maintenance. Did you know that in Pennsylvania, a heat pump runs about 3100 hours a year and an air conditioner runs 850 hours? If you would compare this operational time of your system to your automobile, at 55 miles per hour, your heat pump would compare to about 170,000 miles per year (1.7 million miles in ten years; 2.6 million miles in fifteen years). Your air conditioner would compare to over 46,000 miles per year. A gas or oil furnace runs the equivalent of 126,500 miles per year. Even this is not a fair comparison! For, your car just loafs along at 55 miles per hour, but your heating and cooling equipment runs as fast as it can go all the time in very harsh temperature environments. Most of us have our cars serviced every 3000 miles, but we ignore our heating & cooling systems with the equivalent of hundreds of thousands of miles on it every year. Who would fault their car for breaking down with so much usage? But we are disappointed when our HVAC systems break down. A heat pump functions in the harshest of environments, which can take its toll on the equipment. If your heater or air conditioner unit is malfunctioning right now, it has earned the privilege. If it has not broken down yet, without service, it probably soon will. 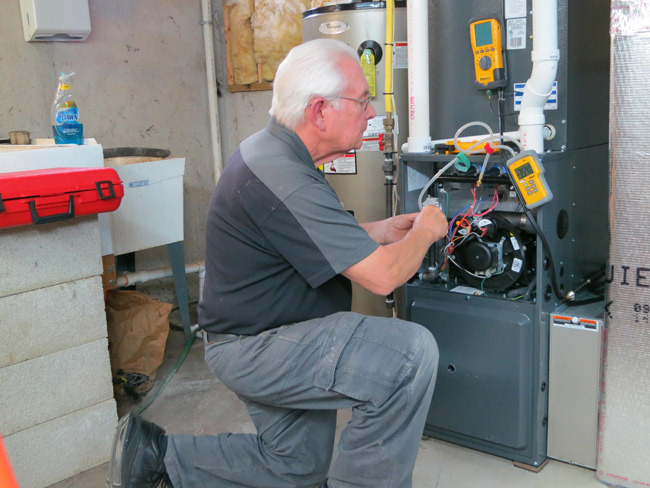 It is safe to say that most heating systems are not operating at peak efficiency. That is not too surprising when you realize the amount of operating hours used each year. Long before your heating system breaks down, it silently and unavoidably loses efficiency, requiring more energy and more money to keep you comfortable. Safety is also an issue. In addition to inefficiency, a 15 year old furnace is like a set of tires with 45,000 miles of wear. Tires become worn from constant grinding and flexing over all kinds of pavement, and it's relatively easy to know when tires become dangerous and need replacing because they wear from the outside in. Furnaces also wear out from expansion and contraction as the burners continually go off and on to provide the heat required. The resulting damage to a furnace's heat exchanger can be compared to bending a piece of metal back and forth until it breaks. But unlike your car tires you have no way to know how dangerous your furnace is becoming because it wears from the inside out. A crack or hole in the heat exchanger of your furnace could allow deadly carbon monoxide gas to enter your living environment. Furnaces should be tested every year for signs of wear or damage and carbon monoxide leaks. Operating an older, untested furnace is as dangerous and life-threatening as taking your family out for a drive on a set of bald tires. We highly recommend our customers to invest in a Planned Maintenance Agreement. The cost of one emergency service can exceed the cost of an Annual Planned Maintenance Agreement. This agreement guarantees that for a yearly investment, we will visit your home or business twice a year (once during the cooling season and once during the heating season) to inspect and test your heating and cooling equipment. We will test the equipment and make the appropriate adjustments – this will help prevent breakdowns and keep your system working efficiently. If equipment problems do occur, they can be solved more quickly and easily before they become major, costly problems. A Planned Maintenance Agreement gives you priority service over non-agreement customers. It also gives you a reduced labor rate and parts discounts. And written reports are given to you on each visit.